Gates are very important when it comes to security, convenience, and even aesthetic appeal. With the addition of a fence and a strong gate, you are adding one more layer of security that protects your privacy and security. With this protection, comes the inconvenience of having to open the gate manually every time you want to go for a drive. This however is quite easy to fix with the addition of an automatic opener. You just have to contact a reliable gate company like us to perform the installation. You would think that because of its size that a large steel gate is indestructible. You would only be partially correct. In a sense, a gate made of steel or iron is highly resistant to impacts from large objects such as cars. Bars and panels may warp out of shape and hinges may be wrenched out of their concrete foundation, but chances are that a heavy gate will stop a ramming vehicle. What it can't stop however is the insidious damage caused by the hands of time in the form of corrosion and rust. If you require steel or iron gate repair services, then don't hesitate to contact us. 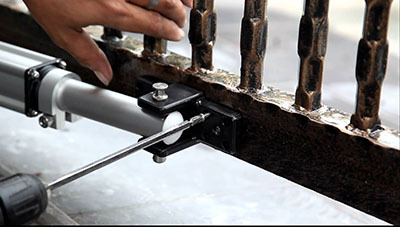 We have the experience and the technical knowhow as well as the spare parts required to fix your gate. Our company not only provides reliable gate repair services but also installation and repair of openers of all brands. Lastly, if your intercom system malfunctions, know that we can get it fully functioning by the end of the day.